Brewster Travel was founded in 1952 as one of the first Trailways members. We offer clean, safe, high-quality motorcoaches for the discriminating traveler. We offer complete tours and transportation including attractions and lodging or charter transportation alone for those wishing to handle the details themselves. We offer charter service and tours with any origin or destination in the continental U.S. and Canada. We have coaches available with a seating capacity of 40 - 56 passengers. All coaches are equipped with DVD and monitors, WiFi, charging ports, PA system, AM/FM/CD stereo, carry on storage, air-conditioning, restroom, reclining seats and a large luggage capacity. We have MCI's (Motor Coach Industries, the leading supplier of motorcoaches) premium motorcoach, the Renaissance, a luxurious, full featured, passenger oriented motorcoach, and Temsa's newest model, the TS45 motorcoach, loaded with customer ammenities. We provide fully licensed, DOT certified, professional, courteous drivers, and meticulously maintained and cleaned motorcoaches for the convenience, safety and peace of mind of our customers. Our drivers are professionally trained and randomly tested for alcohol and controlled substances according to DOT regulations. We have consistently received the highest rating given from a DOT inspection/audit. 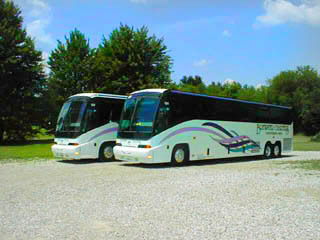 Prices vary with the size of the motorcoach, the origin and destination, and the length of stay. Owners Chuck Smith and Lita Grudier would be happy to provide you with a quote on your travel needs today. Please click on the Contact Us button for help in contacting us.